Shark Tank investor Daymond John and Jen-Ai Norman of Leesa Sleep help unload 250 mattress at Center City's Sunday Breakfast Rescue Mission on Wednesday, April 26, 2017. Daymond John – the founder of FUBU, investor on the TV show "Shark Tank" and motivational speaker – mentioned that phrase in the parking lot outside the Sunday Breakfast Rescue Mission on Wednesday afternoon. He was at the mission, which is nestled between Roman Catholic High School buildings on North 13th Street, to celebrate the arrival of 250 new mattresses for the homeless men therein and an additional 20 for Germantown’s Wayne Hall center for single mothers and their children. 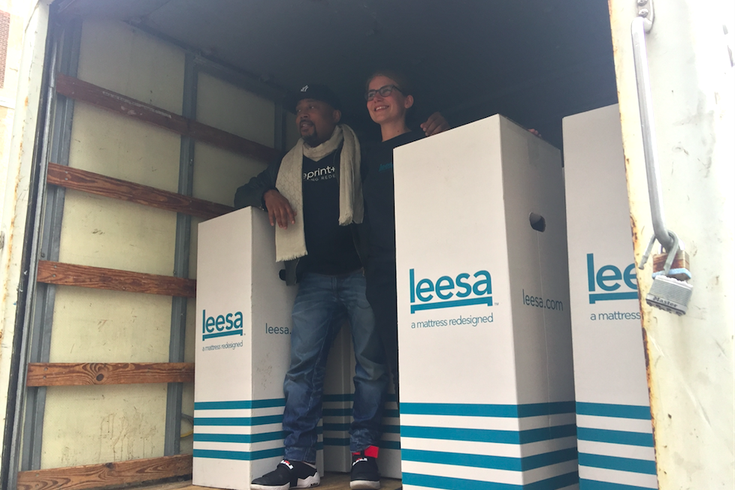 The mattresses – they are “twice as big” as the ones they replaced – were donated free of charge by direct-to-customer mattress company Leesa. Through its One-Ten program, it donates one mattress for every 10 it sells. For John, who’s teamed up with the company in its social-responsibility mission, deflected any credit for the donation, which was greatly appreciated by those on hand as they arrived. Those expressing appreciation included "Chef Anthony," who went through the mission's one-year "Overcomer" program in 2014 and now works as the facility's head chef. Coupled with meals and words of inspiration, the new mattresses will help residents get a comfortable night's sleep as they work toward reclaiming their lives, he said. "It's my calling to help feed the homeless," he said. "You're only a paycheck away from being homeless. It can happen to anybody." 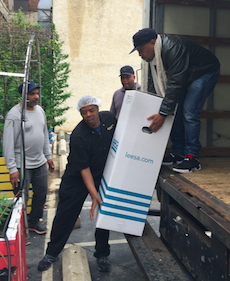 Daymond John unloads another free mattress at the Sunday Breakfast Rescue Mission. John reiterated that sentiment as mattresses were taken off a truck and carried up to the third and fourth floors of the mission. Wednesday's event was emblematic of the company’s philanthropic commitment to giving back through actions, not words, he added. Instead of focusing solely on profits, people now ask businesses “what have you done for the community." Jen-Ai Notman is Leesa's head of social impact. She lauded the rescue mission’s staff and volunteers as doing work that “is nothing short of extraordinary.” She also explained why this was a perfect fit for the company. The mission was chosen for Leesa’s first-ever giveaway in the Philadelphia market because John was familiar with the city and its history speaks to commitment to helping the needy. Leesa’s new partnership with John, and the timing, made the recipient a no-brainer, she said. Bob McGann, director of advancement for the mission, drew a parallel to another big event that’s drawing attention to Philadelphia to show how appreciated Leesa’s donation is.